If you think that an exaggerated engine and a good number of horses makes the difference between a sports car and a normal one you are probably wrong. Since 1952 Colin Chapman teaches us the exact opposite. 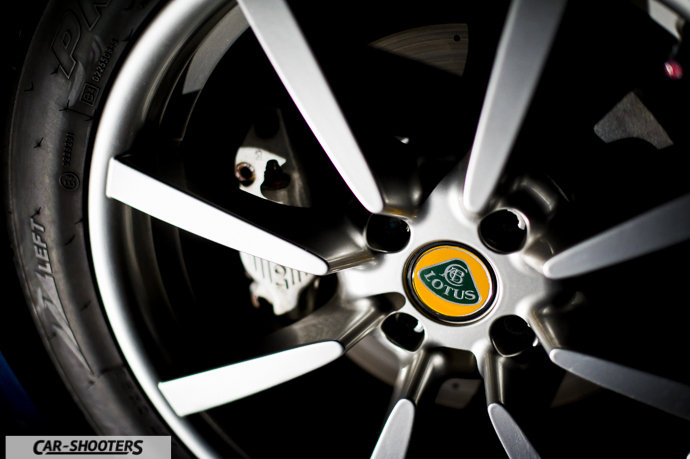 The Lotus philosophy is based on the extreme weight reduction, the elimination of all the superfluous component and the use of highly refined chassis. 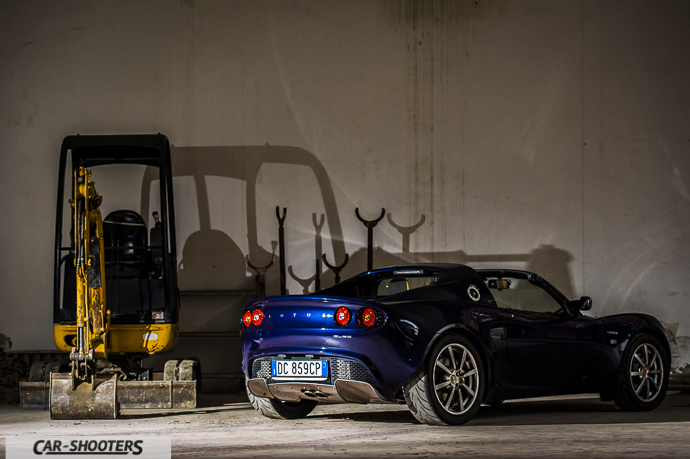 The Elise, one of the most successful models, is the perfect embodiment of the Chapman’s thought. 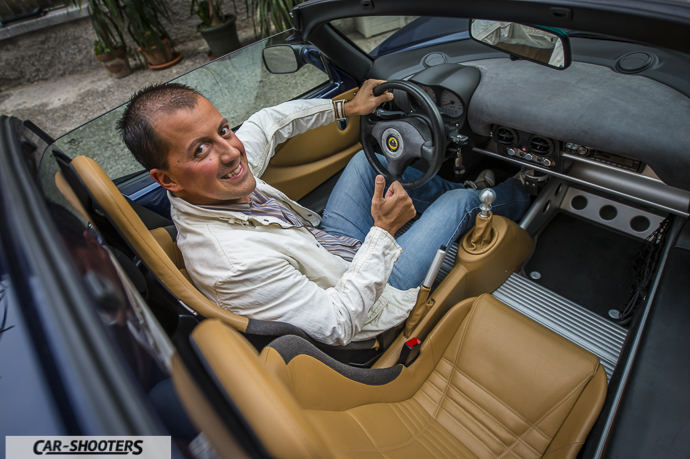 In 1996 this little spyder is presented from the brainchild of the Italian Romano Artioli, owner of Lotus and Bugatti at that time. 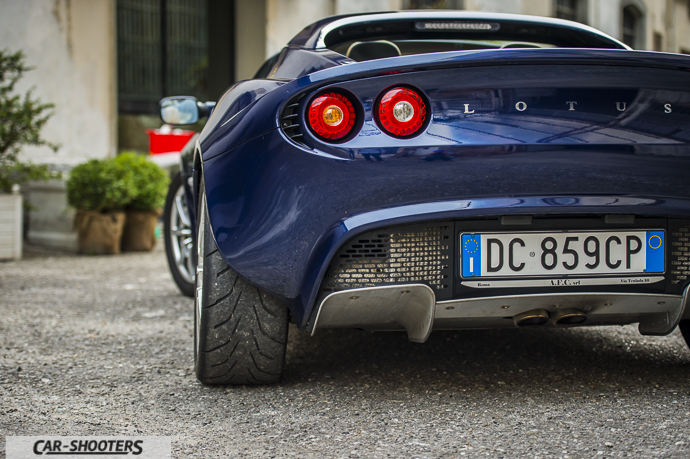 The intention was to raise the Lotus brand in the automotive industry. 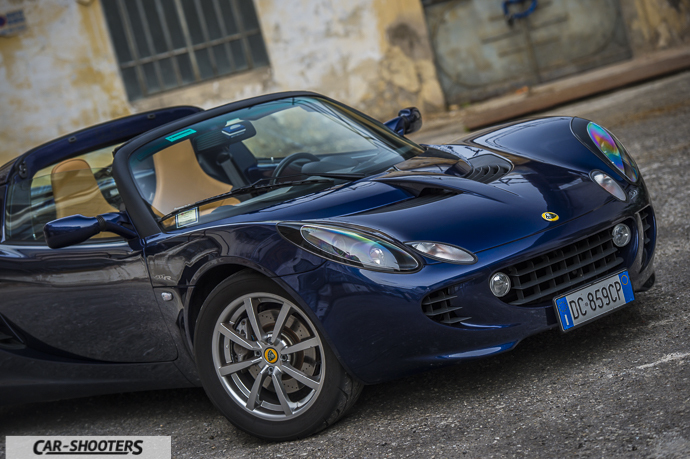 The basic idea was the Lotus Seven, an open wheel sports car. The intent was creating a car with the same dynamic performances but more accessible and suitable for the normal use at the same time. After that began the development of the project M111. 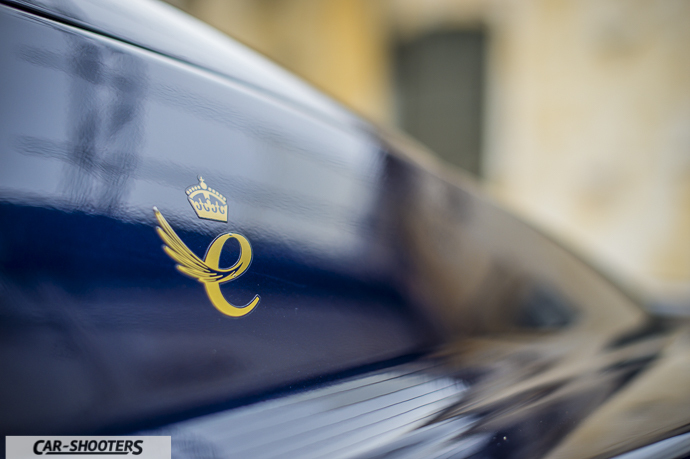 The designer Julian Thomson, inspired by classic cars, created the fiberglass body. The frame, a true work of art, was built entirely of aluminum just to follow the intent of the maximum lightness. The peculiarity of this frame is not to be soldered as the majority of automotive chassis. 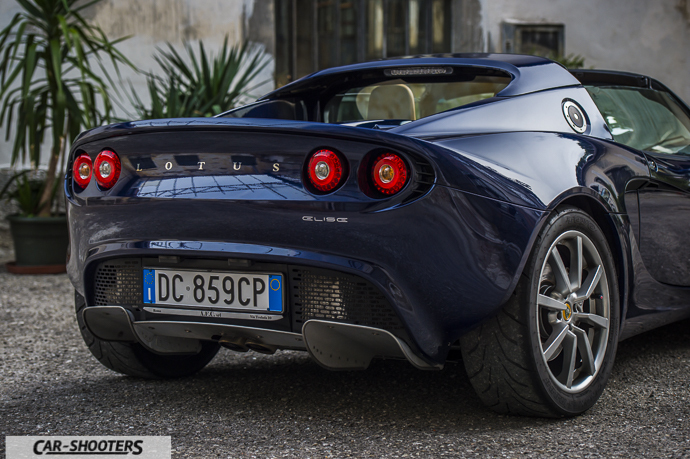 The choice followed by Lotus is using extruded panels, a solution seen only in aviation. This system allows to reduce the weight compared to a conventional chassis and to maintain the mechanical properties of the materials. To be mentioned is also the advantage of a better distribution of the forces on the connected parts, for the benefit of torsional rigidity. All just in 68 kg. The engine was a Rover 1.8 16-valve engine, with just 120 horsepower known for its unreliability. 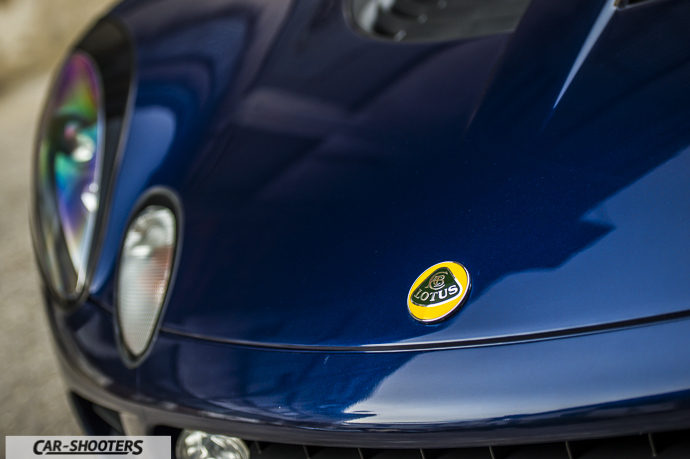 Despite the low HP, carrying only 720 kg, the Elise was able to get genuine sport performances thanks to an extremely good power to weight ratio. 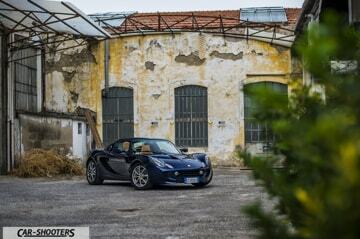 The Elise that we are presenting in this article is the second series, in 2001 the exterior design has been revised, improving interior trim and comfort on board. The aluminum frame and the mechanical characteristics remained practically intact. An important step has been done in 2004, when the Rover’s engines has been replaced. 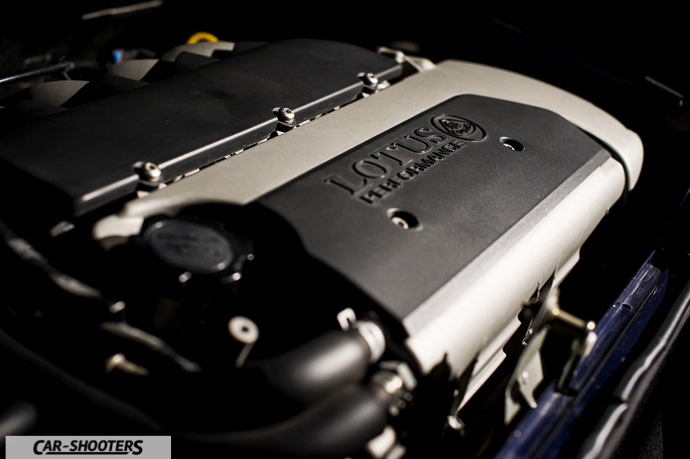 Lotus moved for a 1,8L Toyota’s engine built with the collaboration with Yamaha that also equips the Celica TS. Equipped with an aluminum cylinder head, variable valve timing and lift of the valves is deliver more than 192 hp at 8000 rpm. 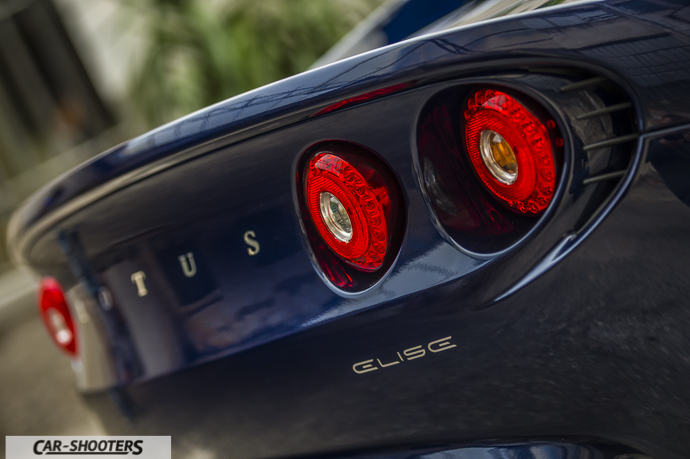 Finally the Elise is equipped with an engine with truly reliable performances. In this way the small English car is transformed into a real track day “animal”. 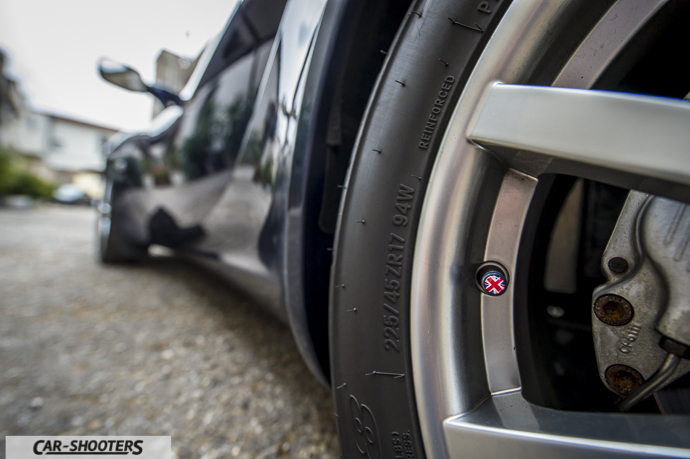 The weight is always low, we are at 860 kg, with its 192 horses get a great power to weight ratio of 4.48 Kg/HP. 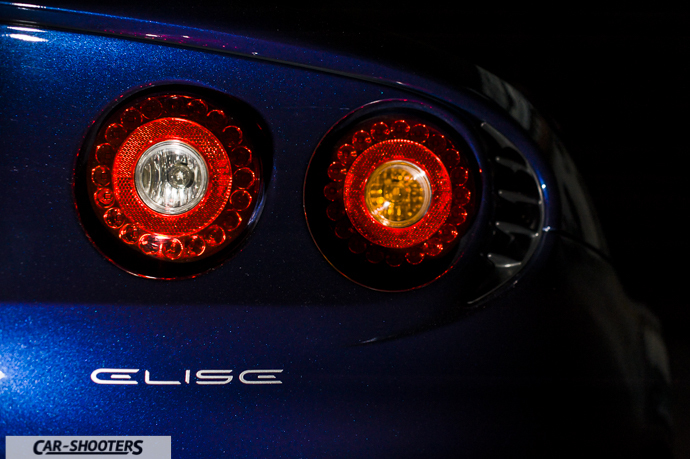 This make the Elise capable of 240 km/h top speed and a 0-100 covered in just 5.2 seconds. Certainly not a record, of course, but enough to overtake on a mountain road lots of heavy supercars equipped with much more powerful engines. The cars showed is equipped with this Toyota engine. 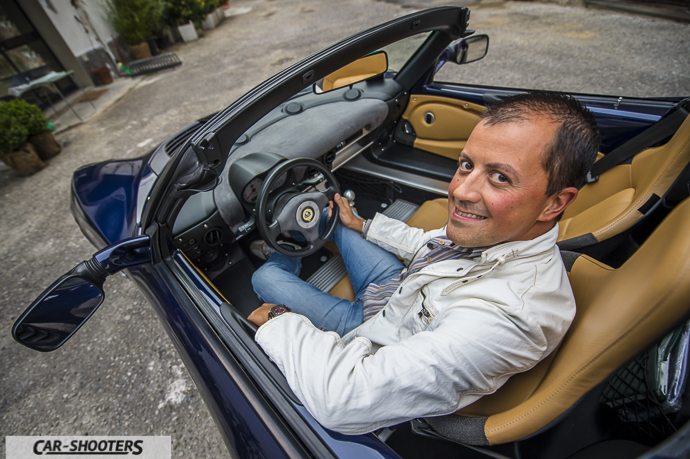 We meet Alessandro, a lawyer coming from Prato and a Lotus enthusiast, lucky owner of this fantastic Elise. Edoardo and Marco this time choose a particular scenario, it’s the Italo Bini factory located in Via Pistoiese 138 in Prato. I did not believe how much this abandoned factory fits well for this photoshoot! 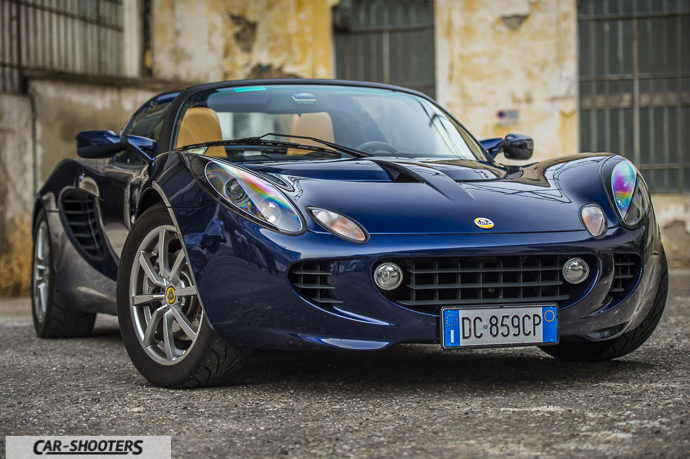 I admit, the Lotus Elise is one of my great loves. I think that is impossible to not be fascinated by the extremely soft lines with sport attitude that compose it. If you then add the vents on the bonnet, the rear diffuser, the wraparound windshield as the racing prototypes and the beautiful alloy wheels enclosing the braking system with perforated discs, you get a mix of unique charm. 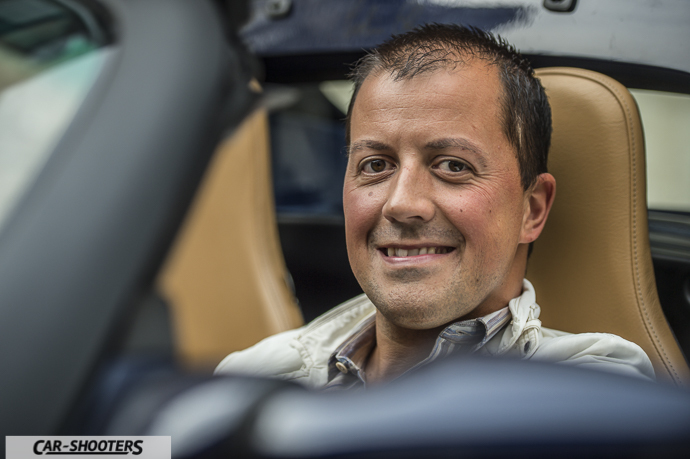 I take a bit of time to go around the car talking with Alessandro. He tells me that he bought his car in 2006, when the second set with a Toyota engine was slightly revised in two particular. Instead of the traditional throttle cable mounted in a modern electronic fly-by-wire and taillights were fitted with LEDs. An important optional is the “touring pack”, which basically includes leather seats with improved padding to make those comfortable for long journeys. The paint set “night fall blue” combined with the cream colored seats is really striking. I notice a strange detail in the back, a double brake caliper. 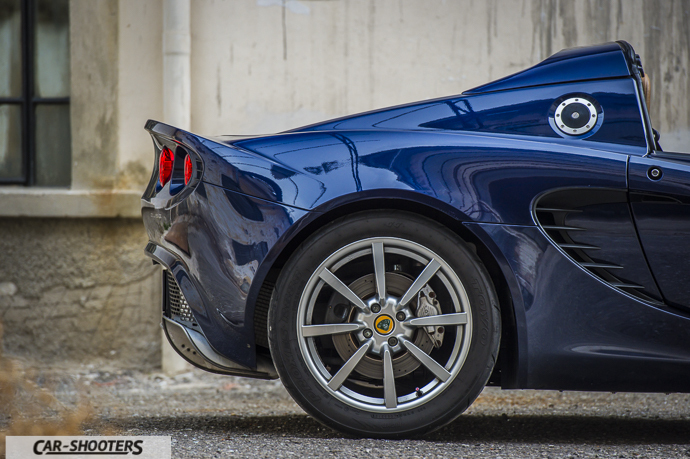 Despite the very low weight and outstanding driving dynamics, braking has always been a weak point for the Elise. To eliminate that problem, Alessandro mounted the front brake calipers at the rear and the original calipers were driven only by the handbrake. This solution make possibile having a double brake at the rear, one for the hand brake and one for the normal braking as now is habitually adopted on different supercars. It’s the time to get in the car to put that in the right pose for the photoshoot. When I seat in the car I have to practically get down to ground level. With my height of 1.85 with various contortions I am forced to bypass the large sill and put myself on the seat, which is good to let it all back for easy access. Once inside the seat is surprisingly comfortable. 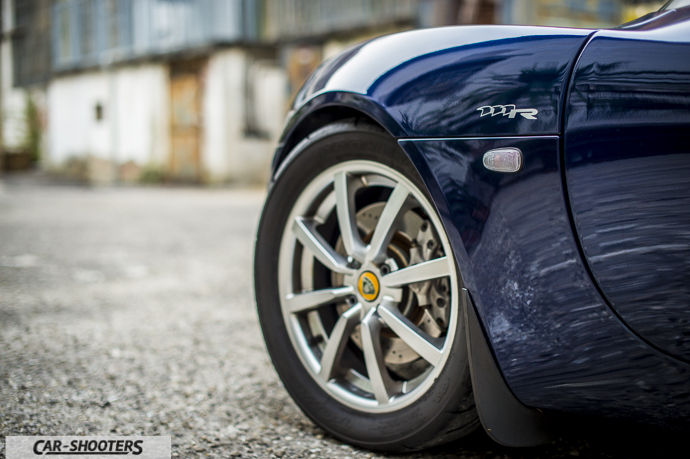 When you take in your hands the little wheel you feel at one with the car, just like on a sports car should be. Inside you can mainly see aluminum, present virtually everywhere: the gear knob, pedals, floor, the center tunnel and the lower part of the dashboard. The steering wheel is covered in leather and Alcantara. Also the upper part of the instrument panel below the windshield is coated of this fine material. I turn the key, the Toyota engine wakes up and makes you feel his voice very strongly. The exhaust is not the standard one but it mounts a stage II. Very nice also the two terminals pointing downwards. Despite the front tires on 195 and the lack of power steering, it does not make any effort to make even the most narrow turns, thanks to the very low weight. The choice not to adopt this device translates into a total contact with the road, without filters. 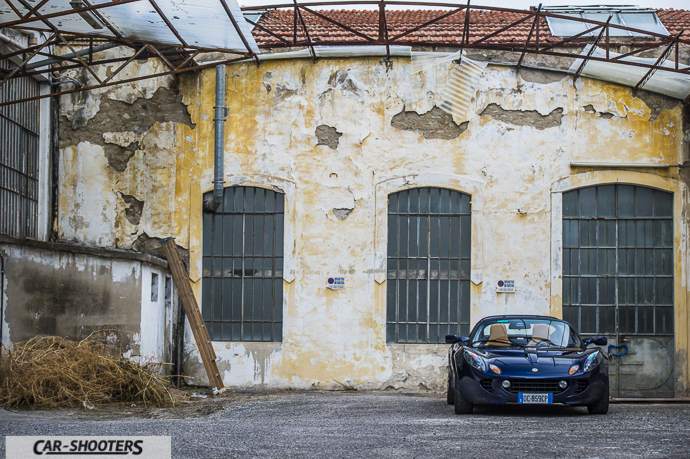 In fact on the modern Alfa Romeo 4C have opted for the same solution. Everything is aimed for maximum performances, you should not expect any kind of comfort in this car. The interior is very hot, the air conditioning (optional) is a must. The engine is over your shoulder. The radiator is placed in the front and in the large sills is flowing coolant at very high temperature. The noise in the passenger compartment penetrates very strongly, if you want to rest your wallet or cell phone, there’s not so much places. The boot is reduced to a small place which is accessible by opening the engine cover. 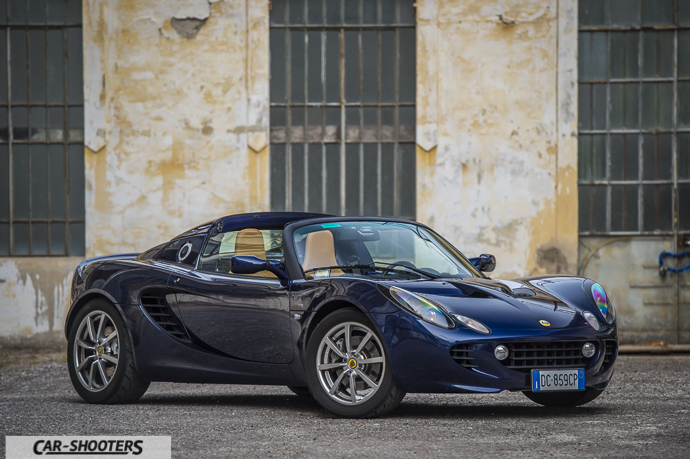 I think that is not so much important because the Lotus Elise is now one of the few machines that can give you true feelings. 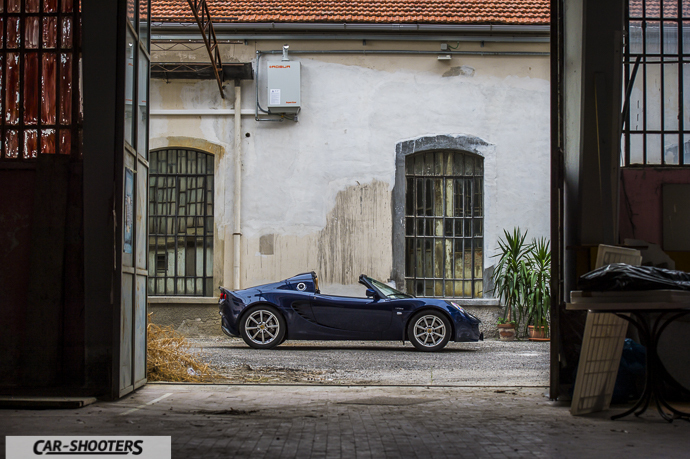 Is time to end the photoshoot and say hello to Alessandro with his beautiful Lotus that leaves with a fantastic sound between the walls of the old factory.